With over 35% of children in Islington classed as living in poverty, many families in the borough won't be able to buy gifts for their children this Christmas. As part of a Secret Santa campaign, City student volunteers have collected second hand toys and distributed them at a local shelter that houses homeless families. 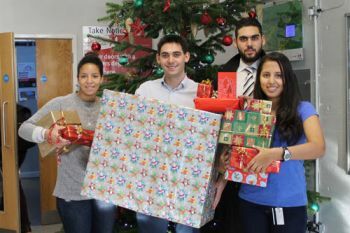 Secret Santa is a student-led project set up by three students as part of the University's Volunteer Management Programme. This programme, launched in October, encourages students to identify social needs in Islington and to devise ways to help tackle them. City volunteer Diana Cleves Martinez is pleased that students and staff have really got behind the initiative: "To be able to make a difference in our local community is a very powerful thing for City students and we hope that this project will help Islington children have a happier Christmas." Adam Pettit, the Community Volunteering Officer at City, said: "The Volunteer Management Programme sees students get involved in fantastic projects like Secret Santa that really make a difference to the local community. Councillor Richard Watts, leader of Islington Council, inspired these students to launch the Secret Santa campaign when he spoke at a recent event about the level of child poverty in the borough." Collection boxes were placed in local schools and at the University's main entrances and lots of generous donations were received. City student volunteers have also made and sent Christmas cards to elderly residents at nearby care homes who may not otherwise receive any cards or presents this year. Watch the video below to see what happened when the presents were distributed at the shelter for homeless families.